Personalization is key to getting more clicks on notifications and ensuring higher retention. CleverTap indisputably is a huge believer of personalization, not just for improved user experience but also for developing relationships between brands and end users. While this helped improve the user experience, it still locked on the same base content for all the users! Your customer base could be a mixture of different classes and styles, and you are probably sending the same common content to all of them. To put things into perspective, picture an office party with Whisky as the only choice of drink! Wine and beer lovers are sure to feel neglected, and will eventually become indifferent. Our clients tried to solve this problem by creating multiple versions of the same marketing campaign. One of our clients created 11 versions of the same onboarding campaign, each one in a different local language! If you think that was the tough part, imagine trying to analyze the aggregated performance of the overall onboarding campaign! 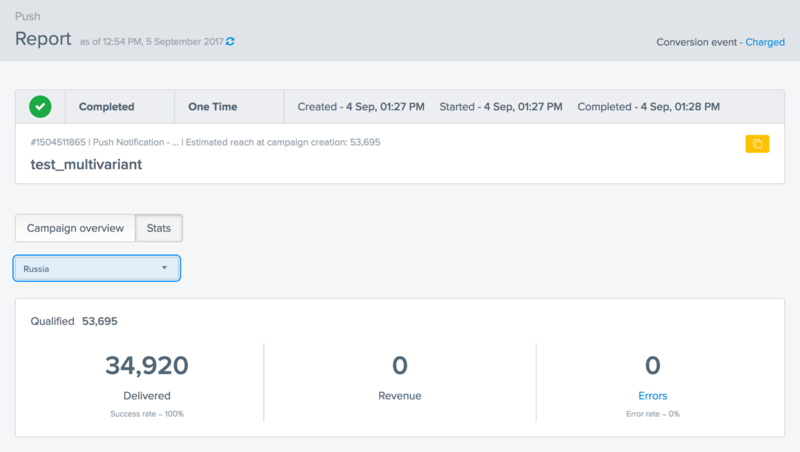 To help make this easier, we decided to build a whole new content option while creating push campaigns, and help our determined marketers be more productive! You can now decide to send different message copies to your users based on the user properties they possess, all under the same campaign! Thus, you can revolve the content of your notifications based on the value of a user property. Let’s consider the above example of language localization. Say you are a company that has users from different regions, with each region having its own local language. 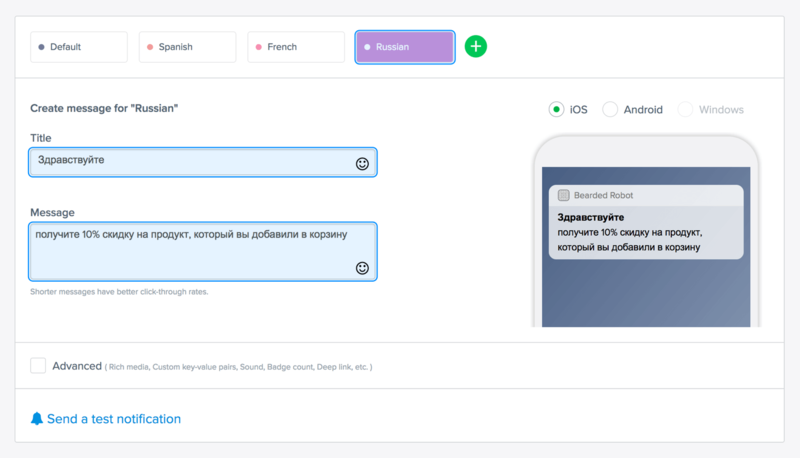 Now, you can pivot the message content on the ‘Language’ user property, and have different message variants for your Spanish users, your Russian users and your French users. If you are an e-commerce store, and you have classified your customers base depending on their spending ability into 3 Customer Types: Platinum, Gold and Silver Users. You can now build a retention campaign recommending premium items to Platinum users and other suitable items to your Gold and Silver users; a premium way to expect higher click through rates! A video streaming business can send out notifications based on the user property ‘Preferred Genre’ of the user. A user with ‘thriller’ as the preferred movie genre will receive a notification for ‘Dunkirk’, whereas a user enjoying comedy movies will receive a notification for ‘Despicable Me’ – A personalized way to increase engagement! You can have multiple values associated with a user property, and you can create a different copy for each of those values, all under the same campaign. 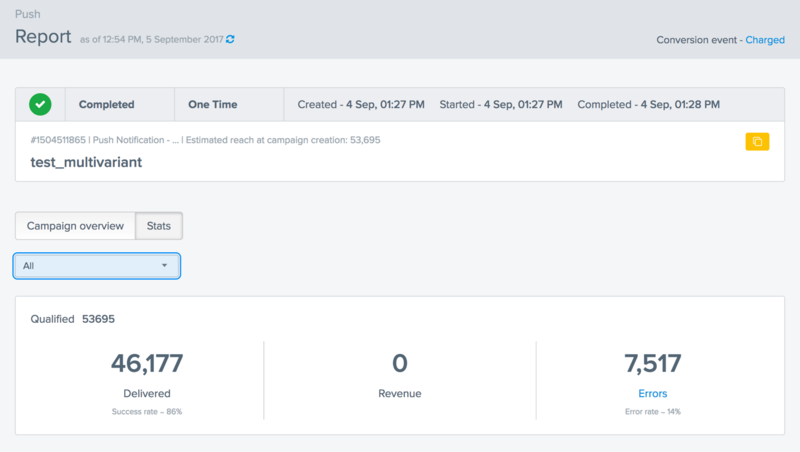 Or, you can split the campaign stats and view the performance of each variant of the campaign. We hope you take advantage of this added functionality while creating push notification campaigns. We’d love to know if this helps solve (or not solve) any tedious use-case of yours! Read more on our docs or sign up for a CleverTap demo now!